The Career Technical Education Center in Chico is combating the skilled worker shortage by launching trade skills academies in a series of 8-week boot camps. The Welding Boot Camp is ideal for people who love to work with their hands, have an eye for detail and the ability to concentrate. Individuals who are unemployed,not currently employed as a welder or employed in a field unrelated to welding are encouraged to enroll. Gloves and safety glasses are included in the program fee and other necessary personal protective equipment is available in the classroom. An optional Open Shop Lab is available for an additional fee. During the last two weeks of the boot camp,qualified participants will be placed with local businesses for up to 30 hours in a non-paid internship. Schedule will vary based on placement. 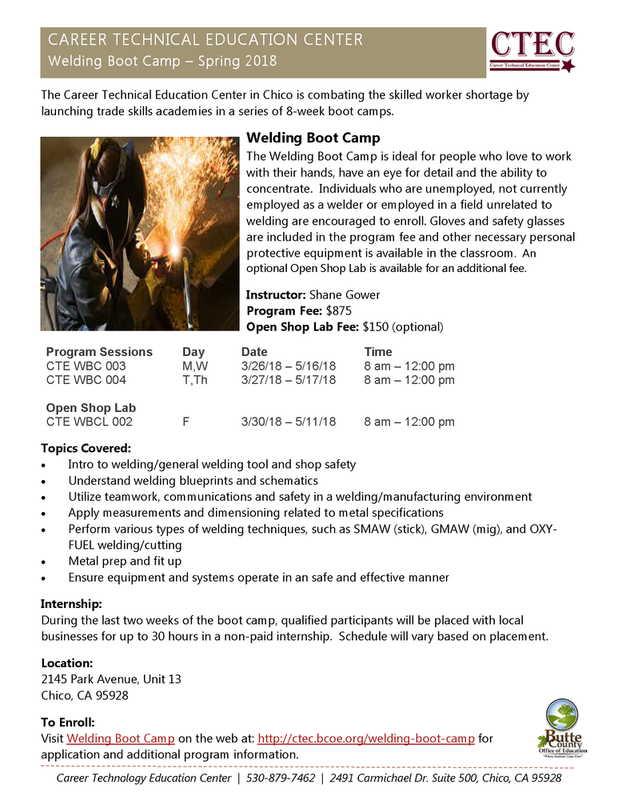 Visit Welding Boot Camp on the web at: http://ctec.bcoe.org/welding-boot-camp for application and additional program information.